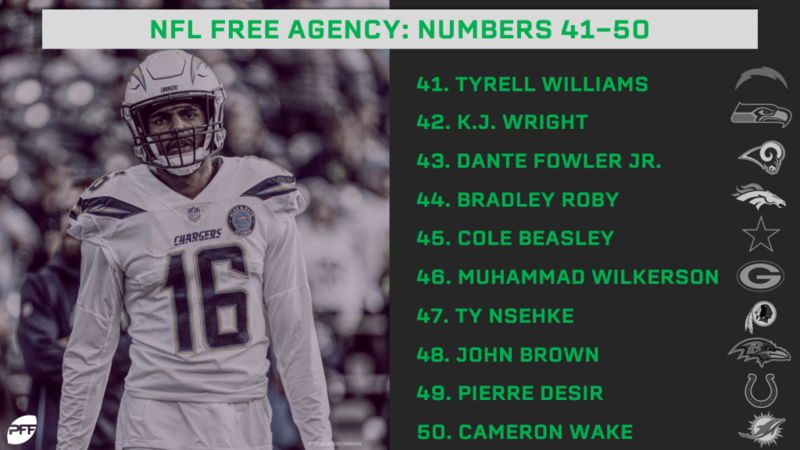 After much debate inside the PFF offices, the official rankings are here. 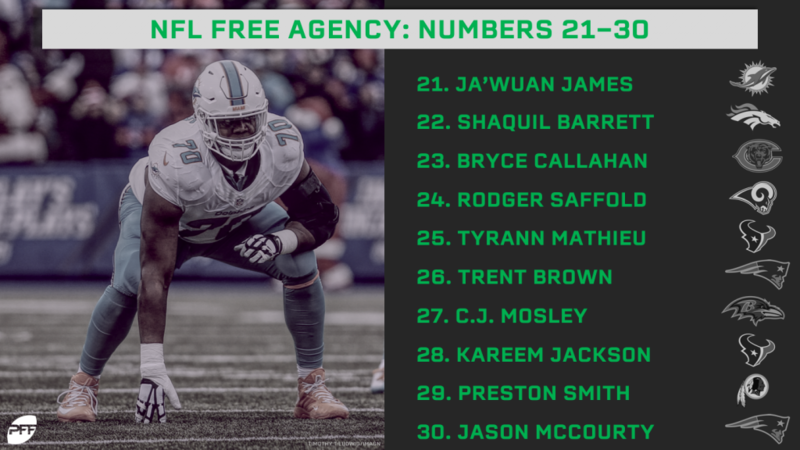 While we have over a month to go before free agency and these are sure to change with franchise tags, re-signings, and cap casualties (we’ll be updating accordingly), this is where we stand at the moment. 2019 is the year to be in need of edge and safety help, but not quite the offseason to pick up talent on the offensive side of the ball. The Cowboys asked him to prove it, and Lawrence did just that. His 89.5 overall grade this season ranked seventh among all edge defenders in the NFL. Soon to turn 27, Lawrence is the rare elite edge defender hitting free agency in his prime. *Update* Lawrence was given his second straight franchise tag after a near-elite season in 2018. He’ll suit up for the Cowboys again in 2019. On the one hand, he’ll be 30 years old coming off a broken leg. On the other, he’s been unquestionably an elite safety nearly his entire career. Thomas earned 90.0-plus grades each of the past two seasons, and even if he loses a step at his age, he’s still the best safety on the market. 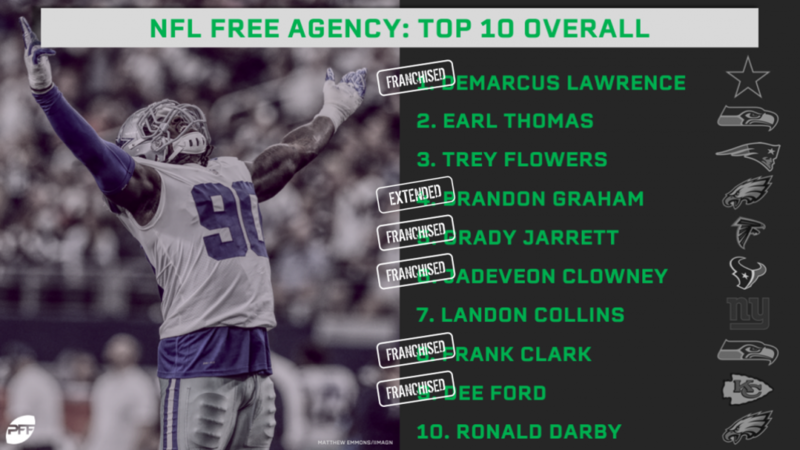 Flowers may be one of the best values in this year’s free agency class. He’s never put up huge sack totals, but he’s been one of the most versatile and consistent pass rushers in the NFL over the past couple of seasons. He produced 60-plus pressures in 2017 and 2018 while playing from virtually every alignment on the Patriots’ defensive line. Graham may be 31 next season, but he’s aging like a fine wine. He’s notched 213 pressures over the past three seasons, and he is arguably the best bull-rushing edge defender in the NFL. Graham may never be a high sack total guy, but he impacts both the run and the pass at a high level. *Update* Graham was extended with a four-year, $26-million extension on March 1. Interior pressure is at a premium in today’s NFL and Jarrett is one of the premier pass-rushing defensive tackles entering his prime. His 86.7 pass-rushing grade this past season was fifth-best among all interior players. He’ll be 26 next season and this year’s interior class is relatively thin. *Update* Jarrett was given the Falcons’ franchise tag and will play through the 2019 season with Atlanta while working on a long-term deal. The physical tools are off the charts, and we love the way he’s progressed every year grade-wise, but the pass-rushing still isn’t at an elite level. His 78.8 pass-rushing grade this past season was a career high. Still, he’s a movable chess piece and elite run defender who might actually be at his best rushing the passer from the interior. *Update* Clowney’s franchise tag designation came after a career year in overall grade and pass-rush grade. Collins, like the rest of the Giants’ defense, didn’t have his best season in 2018, but we’ve seen enough in the past to know what he’s capable of. Collins is one of the games premier box safeties and teams could even covet his skills in a nickel linebacker role. In his best season in 2016, Collins led all safeties with 46 stops. Clark now has three straight seasons with 50-plus pressures and has yet to turn 26. He notched multiple pressures in every single game this season and is about as safe as it gets in that regard for this year’s free agent class. *Update* Clark’s $17.1M franchise tag holds him in Seattle for the 2019 season while they work on a long-term contract. The high end from Ford this past season was special. He racked up 78 total pressures and had a 91.0 pass-rushing grade. The worry is that his next best season had only 53 pressures and a 66.9 pass-rushing grade. *Update* A year removed from leading all edge defenders in total pressures, Ford will suit up under KC’s franchise tag in 2019. He’s only 25, but there is already a legitimate injury tag attached to Darby after playing all of 921 snaps the past two regular seasons. The high level is still there though, as we saw in the Eagles’ Super Bowl run. That year he allowed a catch rate of only 53.7 percent and a passer rating of 72.3. Amos has been one of the most consistent safeties in the NFL, as his 85.5 and 89.5 coverage grades the past two seasons have ranked among the top 10 at the position both years. Amos isn’t the playmaker that teammate Eddie Jackson is, but he has been extremely sound on the back end. When on the field, Bell was arguably the best running back in the NFL. The problem is that he hasn’t been on a football field in over a year and his last season was his least productive since his rookie year. Bell earned only a 71.0 overall grade on over 400 touches in 2017. After a dominant 2017 outing saw Joyner earn the franchise tag, he took a marked step back this past season. He had 10 combined interceptions and pass breakups in 2017, and that dropped to only two this past season. Still, he’s a missile on the back end who is one of the soundest tackling safeties in the NFL with only nine misses over the past two seasons. He may not be the every-down dominant defensive tackle he once was, but in a rotation, he can still provide dominant play as we’ve seen this postseason. He racked up 48 pressures this past season while still racking up 887 snaps. Paradis was a top-three graded center in the NFL before going down with a broken ankle midway through the 2018 season. He’s likely limited to a zone scheme, but he’s been one of the best centers in the NFL when playing in such a system. He’s never graded lower than 74.0 for a single season in his career. He’s not a true number one receiver – and you won’t find one in the FA class – but he’s an excellent complementary piece. He’s one of the most elusive receivers in the league and deadly on screens. His 58 broken tackles over the last three years are the most of any receiver in the NFL. Hicks looked on his way to becoming one of the league’s elite linebackers early in his career before injuries took their toll. He earned 84.6 and 91.1 coverage grades in 2015 and 2016, respectively. Hicks has only managed 1,043 snaps since though with injuries, but the talent is still there. Williams looked like one of the best right tackles in the NFL in his only full pro season back in 2017. He earned a 78.0 pass-blocking grade that year but only played 56 snaps this season before being placed on IR. He’ll have to prove his knee is healthy, but he’s produced the single best season of anyone in this free agent tackle class. Early in his career, it looked as if Richardson was on the path to becoming one of the league’s elite 3-techniques. Over the last three years though he’s never quite taken the next step. His 83 pressures over the last two seasons are solid, but a clear step below the top pass-rushers in this class. Clinton-Dix has been one of the most consistent playmakers at the safety position in the NFL throughout this career. He’s notched at least three picks in every single season of his career. He’s never quite taken the next step in terms of consistency though, and it’s concerning that a safety-needy team like Green Bay was so willing to part ways with him. So many teams are simply looking for consistency at tackle and James brings that. His lowest pass-blocking grade over the past four seasons is only 67.3, which is far from liability territory. Injuries are a concern as just one of those four years was a full season, but he has plug-and-play ability at right tackle. Barrett’s price tag in free agency got torpedoed by the Broncos draft Bradley Chubb, but he still performed admirably in a part-time role. He’s earned a pass-rushing grade above 70.0 every single season of his career and earned an 82.6 overall grade as a starter in 2017. He’ll be viewed by many as a slot corner only, but that’s a position that’s increasing in value every year. He earned coverage grades of 81.3 and 77.3 in that position the past two years and is undoubtedly one of the best full-time slots in the NFL. Callahan allowed only a 75.6 passer rating into his coverage this past season. Saffold was a stalwart on one of the best offensive lines in the league this past season. He earned the third-best run-blocking grade among all guards in 2018 and could fit in any scheme you’ll find in the NFL. He won’t get a mega-deal as he turns 31 this offseason, but he’s nowhere near the end of his usefulness. Mathieu had to take a prove it deal after the injuries piled up and he was cut in Arizona. Mathieu proved he’s still more than capable of making plays around the line of scrimmage. While he looked uncomfortable as a deep safety at times, he earned the fourth-best run-defense grade of any safety and notched the seventh-most stops. Not even 27 yet, Mathieu looks over his injuries woes. Brown had a fantastic season switching from right tackle in San Francisco to left tackle in New England, but he’s not without worry. Offensive linemen don’t have the greatest track record leaving line coach Dante Scarnecchia and Tom Brady’s quick release. Brown still struggled against some quicker rushers as well, most notably Jerry Hughes and Yannick Ngakoue. Mosley has been the definition of solid throughout his career. He’s played 5,160 snaps including the playoffs in his career and only his 2015 season had a grade below 70.0. He’s also been incredibly sound as a tackler, with single-digit misses each of the last two seasons. While he was a cornerback this past season, Jackson may also have a second act to his career that sees someone coveting him for his ability to play safety. Houston dabbled with him there and in the slot this past year, and it led to his highest graded season since 2014. Smith is a very intriguing prospect after a breakout season of sorts in 2018. His 76.9 overall grade was a career high, and he racked up over 50 pressures and 20 run stops as a full-time starter. McCourty will be 32 next season, but we’ve seen him revive his career in two very different schemes in Cleveland and New England the past two seasons. His 79.1 overall grade this past season was his highest since 2012. This one is a pure projection for the 26-year-old quarterback. 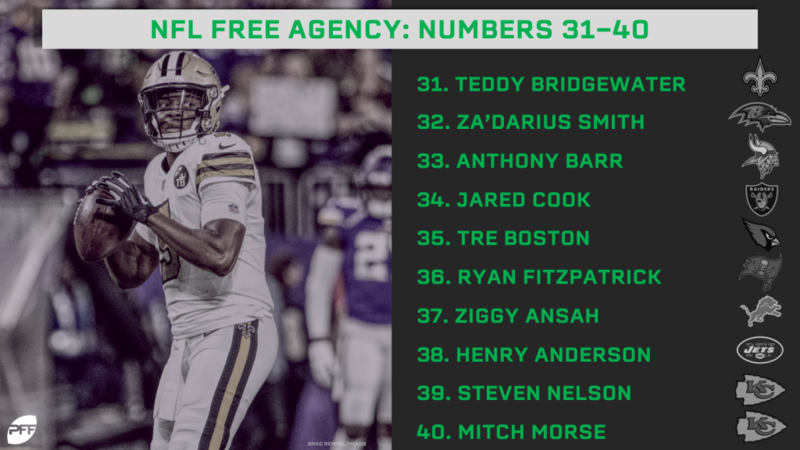 Bridgewater looked ‘back’ enough after an 80.9 preseason grade in 2018 for the Saints to give up a third-round pick for him. At the same time, his lone regular-season start in Week 17 he earned an uninspired 59.0 overall grade (albeit with backups). Smith wasn’t even on the radar before a breakout year saw him tally 60 pressures in the regular season. He has some versatility to play outside and inside that will be coveted, but it’s worth questioning whether 2018 was a fluke or sign of things to come. We saw Barr play at an All-Pro level in 2015 with a 90.0 overall grade, but that might as well be a different player altogether at this point. He hasn’t earned a coverage grade above 70.0 since then, and he tallied a meager 20 stops this past season. The best fit for him might be to kick him back to the edge where he played at UCLA. He’ll be 32, but even if he has lost a step from the 4.49 he ran at the combine in 2009, Cook is still a fantastic athlete for the position. His 1.83 yards per route this past season was seventh-best among tight ends. After a breakout contract year for the Chargers in 2017, Boston ended up having to take a prove-it deal with the Cardinals and was yet again solid. He had 10 combined interceptions and pass breakups on 30 targets. The high level from Fitzpatrick this past season was inspired, while the low was the reason he wasn’t given a starting job anywhere the last time he was a free agent. If you need a backup to come in and win a few games when your starter gets injured, there’s probably not a better option in the league right now. The Lions were forced to franchise Ziggy Ansah after how desperate they were for edge help last offseason, but he managed to see the field for only 146 snaps due to injury. He’ll be 30 next season now and hasn’t notched 50 pressures in a season since 2015. 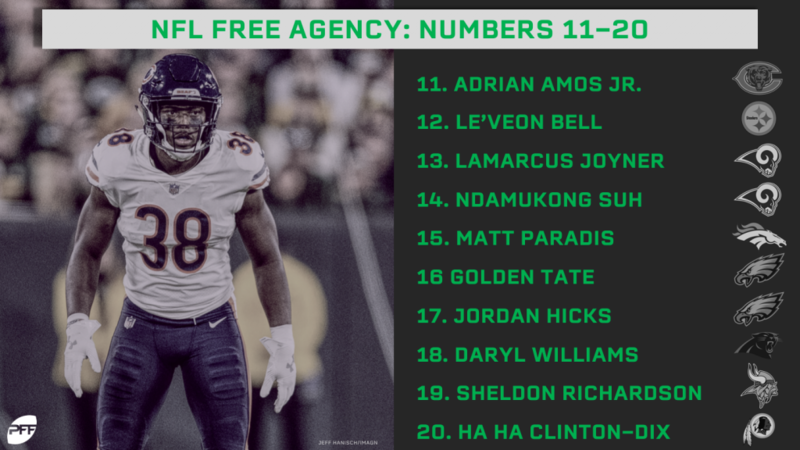 Once a promising rookie, Anderson never quite regained form after an ACL tear, and he was dealt for a late rounder to the Jets last offseason. However, he quietly put together his best season as a pro in 2018, and his 48 pressures were the 12th- most of any interior player in the league last season. While he still gives up too many big plays, Nelson turned into a playmaker himself in 2018. He managed 10 pass breakups and four picks while allowing a catch rate of only 53.1 percent in his coverage. In a weak corner class, Nelson is trending up at the right time. Morse has never been anything special as a pass blocker, but his work in pass protection would be an upgrade for many teams. He earned an 81.2 pass-blocking grade and allowed only four pressures on 443 pass-blocking snaps this past season. While he’s never played anywhere other than center in the NFL, he has the body type to play guard as well. Williams had a breakout 2016 without Keenan Allen, but he has been unable to replicate that success with Allen in the lineup. His 1.41 yards per route was 54th among 96 qualifying receivers in 2018 and a far cry from his 1.83 figure in 2016. Wright has been trending downwards ever since he earned an 88.3 overall grade back in 2015. The Seahawks linebacker hasn’t graded above 70.0 in coverage since, and he will be 30 next season. He’s still one of the best tackling linebackers in the NFL and has only one season with double-digit misses in his career (2014). While the production still doesn’t match his top-five draft selection, there are still reasons to covet Fowler. The biggest being that he hasn’t even turned 25 yet. The second-biggest is that he’s improved grade-wise every single season of his career with his performance in the NFC Championship being arguably the most impressive of his career. Roby finally got his chance to prove himself as a full-time starter with Aqib Talib gone, and it did not go as planned. He allowed a 65.9 percent catch rate and 117.3 passer rating this past season. There’s still solid play from the past to lean back on, but his stock took a big hit in 2018. One of the most consistently effective slot receivers in the NFL, Beasley had the seventh-most yards from the slot of any wideout in 2018. It’s also worth noting that he has all of 14 dropped passes in his entire career for a drop rate of only 4.0 percent. Wilkerson looked much improved with a 76.5 overall grade the first three weeks of the season in Green Bay before breaking his leg against Washington. He fell off a cliff in New York after signing a big contract and had back-to-back overall grades below 70.0. For a man who’s not even 30, it’s difficult to think he can’t get back to quality play. We might finally get a chance to see what Nsehke can do as a full-time starter at tackle. Washington utilized him as a swing backup for basically every position but center in his tenure there. He performed admirably jumbling around but looked best at tackle where he had a handful of highly-graded performances. The deep threat ability that saw Brown rack up 370 deep yards and over 1,000 total receiving yards in 2015 didn’t suddenly go away. Brown just hasn’t had a quarterback that could find him since. His seven deep receptions in 2018 were 28th-most in the league. Desir was a perfect fit with his size and length in the Colts Cover-2-heavy scheme this past year, and Desir earned a career-high 77.7 overall grade. He’s not a guy you want playing a ton of man coverage, but enough teams are zone-heavy enough to give Desir a shot. The special ones can be ageless sometimes, and Wake qualifies as such. He’ll be 37 next season but had an 81.1 pass-rushing grade yet again in 2018. While injury is obviously a concern at his age, Wake has registered at least 50 pressures in every full season of his career.